View More In Routers - Page 2. SR3200 comply with 802.11ac technology to provide up to 1200Mbps wireless access speed, it is 4 times higher than 802.11b/g/n products, while the NAT conversion rate> 93% s to achieve faster download/upload speed, make online surfing arbitrary. Through wifi analyzer function of the surrounding wireless signal field strength and channel analysis, follow up the results to select the channel with less interference, can effectively control the WiFi interference between each Wireless AP, to creat a stable and smoothly wireless network. Designed in Power Amplifier on PCB board, greatly improved the WiFi signal wall-pass-through capacity and expand the WiFi coverage, And then the RF power is manual adjustable to reduce WiFi Interference and improve wireless stability based on requirement. With USB2.0 port, support DLNA, Samba and TFTP server, easy to do USB storage and sharing through Wireless Signal. 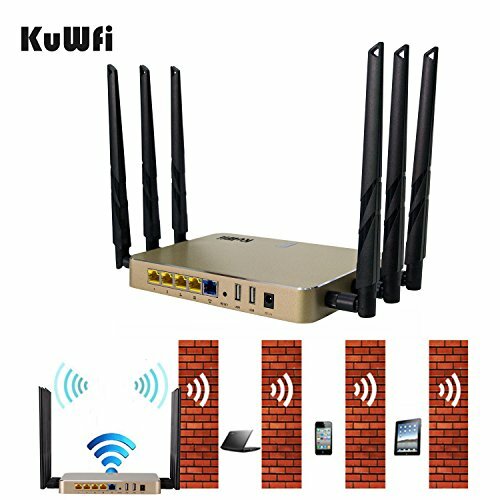 High Power Gigabit 1200Mbps Wireless Router，Enterprise Qualcomm Chipset, 1200Mbps high speed, high conversion rate allows you to surf the Internet arbitrary, support AP, Gateway, Repeater operation modes, Support Cloud server remote management,advertisement and captive portal authentication. USB Storage and file sharing With USB2.0 port, support DLNA, Samba and TFTP server, easy to do USB storage and sharing through Wireless Signal. If you have any questions about this product by KuWFi, contact us by completing and submitting the form below. If you are looking for a specif part number, please include it with your message.